Amsterdam - The Old Church 2. In a side chapel the Red Door leads to the former sacristy. Since the reformation couples with marriage intentions presented themselves here for formal "bans of marriage", in Dutch "ondertrouw". Such a notice is a step between engagement and marriage. Introduced in the Middle Ages, it is today still an obligation by law in the Netherlands and Belgium. The document is always publicly displayed. In Amsterdam it also had to be proclaimed aloud in church for 3 Sundays in a row, to make sure there were no objections. 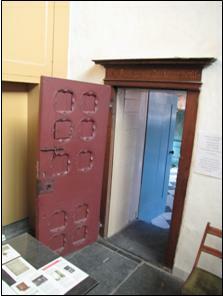 In 1634, Rembrandt too had to go through this Red Door for his "bans of marriage" with Saskia. 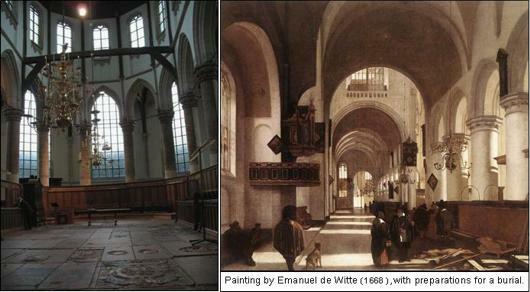 Not more than 8 years later, in the year Rembrandt painted the Night Watch, his wife, model and inspiration was to be buried in this same church. More Old Church on this website : Old Church - page 1. On museum Rembrandthouse, only a short walk away : www.rembrandthuis.nl . If you're interested in more Amsterdam history, how about a private history walk ?